(Nanowerk News) Graphene is a remarkably strong material given it’s only a single carbon-atom thick. But finding ways to do something with it – that’s also affordable too – have always been a challenge. Scientists have long been excited about the potential for graphene to revolutionise technologies, and even consider it a technology itself. Graphene is the best known conductor of electricity and heat. It is also the thinnest surface and represents the next generation wonder material for everyday applications in electronics. The 2010 Nobel Prize in Physics was awarded to Konstantin Novoselov and Andre Geim for their pioneering work on the electronic properties of graphene. There followed much hype in the science world with concepts to revolutionise electronic displays and circuitry. These two areas form the basis of many technologies so the impact of graphene was extensive. For such applications, graphene had to be industrially produced as large thin films on a supporting material. This highlighted two avenues where graphene could be directed: as an electronic component; or as the chief technology. But these directions were rather narrow, as they only focused on potential commercial exploits involving the electronics industries. Exaggerated demand for graphene to be commercialised quickly outpaced the overlapping challenges concerning the processing of nanomaterials. As such, despite all the excitement, graphene has not yet found widespread use because it is chemically difficult to process. In 2009 I developed the first technique to chemically produce graphene in industrial scale quantities ("Gram-scale production of graphene based on solvothermal synthesis and sonication"). It was clear chemistry had a key role to play in the future use of the material. We could now create gram and kilogram quantities of the graphene sheets atom by atom using chemical reactions. My work has led to many attempts by researchers world-wide to find more viable techniques to produce graphene. Each attempt reaching out to be inventive, quirky, or more innovative over the prior art. We found an avenue where expensive apparatus was no longer required and graphene powder could be transported with an extended shelf life. This is now a common goal among researchers. This development overcame a key tenant which was overlooked during the physics era: graphene is essentially a material which is all surface. The interface at a surface is where exciting things occur and where chemists operate. 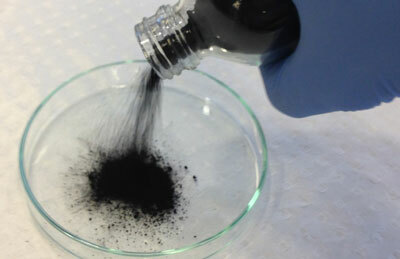 To do something useful with a surface you need a lot of it, and we now had a lot of graphene. The options to obtain a lot of graphene material are simple. Either start by digging graphite out of the ground from natural deposits, or you make it chemically in the lab. Chemically produced graphene offers a relatively large amount of surface to perform exciting chemical reactions. This is equivalent to having a nice smooth football field to move a football around on. But changing the chemical structure of graphene while retaining its superb physical properties is incredibly difficult. This is due to a paradox that allows for the very existence of graphene: the remarkable stability of the graphene surface. Molecules like metals and gases required for energy storage simply do not stick to graphene. Imagine if everything you placed on your table simply kept falling off – the table would not be of much use. Attempts to change the chemical nature of graphene focused on attaching a small number of molecules. This has limited the utilisation of graphene in nanotechnologies, as the next generation of batteries, solar energy films and fuel cells involve more complex chemical reactions. Applications that would see graphene used in these technologies would require molecules with versatile chemistry stuck to graphene. Together with my colleagues, we have created a new graphene hybrid material by directly attaching boron clusters to the graphene surface ("Carborane functionalization of the aromatic network in chemically-synthesized graphene"). The trick was to use the stable conjugated network in graphene to trap a highly reactive boron cluster. Attaching these kinds of chemicals unlocks entirely new and interesting material properties, such as improved functionality and hierarchically organised responsiveness. For example, the material may now soon be used to interact with biological molecules, harvest sunlight for use in solar cells, and anchor metals for efficient hydrogen storage. The work will provide an insight into how graphene materials retain their function after large scale processing. We can now perform exact chemical reactions on graphene that will ultimately translate into more reliable and affordable graphene-based technologies. We have pushed the boundaries at the nanoscale and started to find new ways to create materials from the ground up with fascinating properties that can be commercialised.